Flight Idle and the Approach Idle control relay. This problem was causing one of the Boeing 767 engines to run at different rpm’s when they were supposed to be running at the same rpm. Aircraft Engineer Saemi was working with an Aircraft Electrical Specialist with the airline to solve this problem. After they had changed thousands of dollars worth of parts the problem was still occurring. Saemi decided to make a test on the relays while the engines were operational using a Bartol Mag-Probe. What they found was one of the relays was intermittently loosing ground. They replaced the relay and the aircraft is still flying as of the date of this post, October 23, 2015. If the plane had been grounded permanently it would have cost the airlines (the price of purchasing a new Boeing $197,000,000. When including the loss of the Grounded Boeing 767 the total cost to the airlines could have been over $400,000,000. The following video is the voice of Aircraft Technician Saemi explaining how they used the Mag-Probe to solve the Boeing 767 Relay problem. Below are emails from Saemi explaining how they found the problem. Oh yes.. Boeing 767 Been flying around. Idle disagree problem was solved 19 Aug. I’ve been waiting for the problem to appear again. But so far so good. If this happens again I will aim for Boeing 767 Relay K207 with the Mag Probe 🙂 This was a very costly defect as many parts where replaced. With the right troubleshooting steps I’m sure the parts that were replacement could have been reduced. The hardest part trouble shooting this problem was it was an intermittent problem.. The air idle problem was on engine 2. Relay K207 was loosing ground intermittently. Without using the Mag-Probe this would be hard to detect. 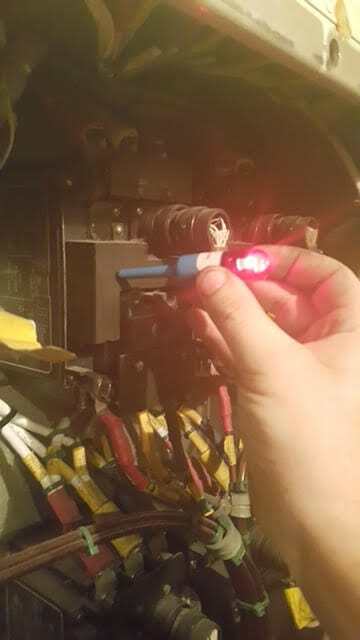 Like I promised before that I will send a statement on how the Mag Probe was useful shooting a B 767 “”” Boeing 767-300 / Relay Intermittent Defect. Engine 2. The Mag-Probe was a big help to solve an intermittent problem with one of the relays that controls the engine Flight Idle & Approach Idle on a Boeing 767-300. With the Mag-Probe it was possible to see the relay was loosing power intermittently, that helped us to determine the fault. It reduced trouble shooting time and a component change was made as a result of the trouble shooting.